What a blast the 6th grade students had on their annual trip to YMCA Camp Campbell in Boulder Creek! Follow this link to read all about it. What a blast the 6th grade students had on their annual trip to YMCA Camp Campbell in Boulder Creek! 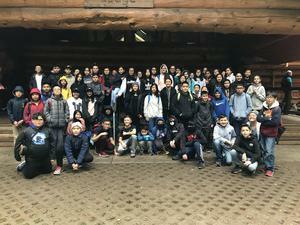 Students were able to explore the local Santa Cruz mountains to learn about the surrounding ecosystem as well as engage in hands-on learning and field study. Each year students are able to get outside, explore the natural treasures of the Bay Area, and learn not only in an interactive way, but also experientially. Students are also presented with opportunities to build character, including learning responsibility, problem solving, team building, and independence.